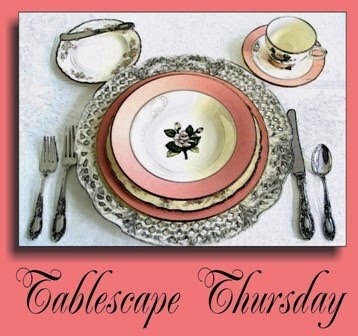 Welcome to the 118th Tablescape Thursday! This post is dedicated to you…the readers of BNOTP. I was so touched by all the expressions of thanksgiving you left on Mikasa’s Facebook wall, I decided to let you write today’s Thanksgiving post. I am thankful for each day with my husband of 42 years, time spent with our children and 6 grandchildren. As well as my Mom who will be 89 this year. Previous PostPottery Barn Inspired Garland Tutorial-Make Your Own! Such breathtaking photos & such touching expressions, Susan…the perfect combination for this Thanksgiving eve! 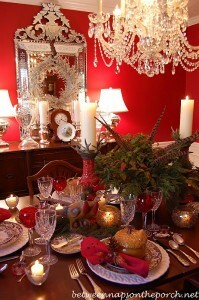 I adore your RED dining room!!! I hope you are with your family & surrounded by their love & caring. You share so much with those of us in the blogging world…you deserve to have it returned tenfold in hugs & praise. Thank you for hosting TT each week. Its always such a treat, even if I don't participate. Don't eat too much pie tomorrow!! How cool are you for such a great idea? I know I feel alot better about my own situation after reading posts from people who are in worse situations, who are positive, and know that they are surrounded in ultimate love. Hugs to you for such a great post and please may you and all your readers have a very love filled and peaceful holiday. What a beautiful post Susan. I am thankful for the people who are away from their families during Thanksgiving, so that our country will be safe. Each day is a blessing for which I am thankful. I will say a prayer for the continued improvement of your son-in-law. Your dining room is so elegant and your table setting is stunning. I loved reading all the wonderful quotes and how kind and loving they are. Happy Thanksgiving. Beautiful tablescape! Great idea to feature what other friends are thankful for! When I first started reading it I thought it was your words and I couldn't believe you had been married 42 years!! LOL! Everything looks just beautiful. The gratitudes of others was very touching. So glad that you included them. Happy Thanksgiving. I enjoyed reading what was written on the wall.. I think we all have so much to be grateful for..
thanks for hosting this party and letting us participate..
Susan, what a thoughtful idea to post the thankfulness of others. It was heartwarming to read each of these while feasting on your gorgeous table. Your dining room is so elegant; regal to be more accurate. Each detail is stunning. I love that you used the Nandina from your yard. Ours hasn't turned a beautiful shade of red, but I need to remember touse it when it does. The berries are also nice to add in to an arrangement. I love to shop my garden for fresh greens and flowers. All the best to you, sweet friend. I'm most thankful that our paths have crossed through blogging. You've been my mentor and a dear friend this past 15 months. Thank You! This has been a most beautiful post. I loved reading all the notes from everyone. Your table is wonderful. I love those reindeer and the pinecone placecard holders. Great! Happy Thanksgivings. Thank you so much for posting all of these wonderful gratitudes. I enjoyed reading these very much. Your table is beautiful, as always! Susan, you've shared another beautiful table. Happy Thanksgiving to you and yours! Thank you, also, for including the thanksgiving thoughts shared on Facebook. Since I'm not on FB, I would have missed these — and I'm so thankful I didn't. Blessings to each all at this season of Thanksgiving. Wow Susan, your table is so amazing! Absolutely gorgeous and breathtaking! Love all your plates and mix & matched silverware. Have a wonderful Thanksgiving! Thank you for sharing this wonderfully powerful post. That was a lovely post, Susan, The table is fabulous, as usual. The colors are so vibrant! I hope you are recovering from your injury, and I hope you spend Thanksgiving with your family. I don't do Facebook, but I would have said I am thankful to have a home, food for the table, a few coins in my pocket and a family to share my blessings. I am very thankful for all of God's blessings. Simply Lovely! Adore the pine cone place cards! Love all the colors! All is beautiful! Loved reading what each person is Thankful for! Happy Thanksgiving! So beautiful, Susan! Your table setting creates an opulent feast for the eyes. The dining room is the perfect "stage" for your creation — shimmering and splendid, complementing the warm organic textures from nature of the centerpiece, antler flatware, and pine cone place card holders. And then there are the quotes — some moved me to tears; others made me smile with the shared joys of life and the love of families. So special and so YOU! Happy Thanksgiving, my dear friend! Beautiful pictures and sentiments. It makes you reflect on what gives our lives meaning and how this holiday, which can seem overlooked in the pre-Christmas rush, continues to touch our souls. Hope everyone has a wonderful Thanksgiving. Gorgeous tablescape, Susan! I love the reindeer flanking that lovely leafy centerpiece and candles. Thanking you once again for your hospitality in hosting TT! you made a really opulent tablescape for Thanksgiving. I am thrilled by this warm red colors, not only the room but also the berries and leaves look like cozy fire into a mantle. You have set the table so special with the Spode Woodlands and all the bird additions. Lots of cute things to discover. I love your thoughtful idea to feature the thankfulness of your friends as much as your own. 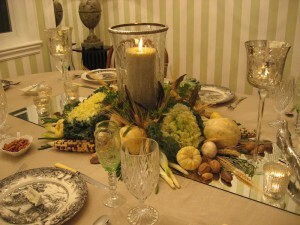 Have a wonderful Thanksgiving and be sure, we all are thankful to have you as our hostess for this feast of tablescapes. Happy Thanksgiving Susan to you and your family. A beautiful post from a beautiful person. You are such a sweetheart and I love to read your blog. You were my inspiration to start blogging…your blog was the first I found when surfing RMS. Have a lovely day! Gorgeous as always. Isn't it fun to take things you have had and use them in new and different ways? That is something I try to do. It can be a challenge sometimes but fun. Your table is WONDERFUL! I love the centerpiece! You have just out done yourself. Very clever and sweet way to share the thankful comments. After reading them it does make one more thankful! Have a Happy Thanksgiving Susan. As always you have set a lovely table my friend! Thank you again for hosting another TT and for the work you do to make this all come together so beautifully! Susan, a beautiful and touching post of the many gratitudes in life. Thank you for your hard work and dedication that goes into making every Tablescape Thursday special for us. Your tablescape is gorgeous! Wishing you a wonderful Thanksgiving! Absolutely gorgeous! You inspire me so with the lovely tablescapes you create. This one is perfect for Thanksgiving. Such a lovely and appropriate post. Happy Thanksgiving!!! Susan, your table is beautiful, Happy Thanksgiving to you. Happy Thanksgiving to you and your family, Susan. And, thank you for being an inspiration to all. Your table is stunning, and the perfect place to say and share a prayer of thanksgiving. I loved reading everyone's comments. Happy Thanksgiving to you. Your pictures are lovely as is your table setting. Lot's of detail, I like the deer on the table. THanks for hosting. The posts brought tears to my eyes and made me so thankful for my family and to be here with such a great group of people. Thanks for such an inspiring post. I was almost brought to tears when I read some of the things that people had endured in the last year. My prayers go out to them. I am so blessed. 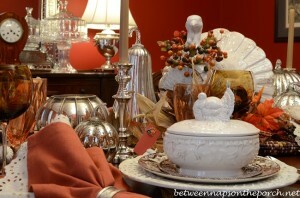 Susan, what a wonderful way to honor your readers by using them in this Thanksgiving tablescape. It's spectacular as usual. Hope you had a nice Thanksgiving. Susan, this is one of my favorites of your many beautiful tables. The red combined with the natural elements in the centerpiece is simply stunning. I really love it. I also love the way you posted the Thanksgiving messages. Just a wonderful Thanksgiving post all the way around. Your table is so outstanding. I might be using the same Woodland dishes but it looks nothing like yours! I love the soup tureens too! Susan,this was a touching post. Thank you for sharing your beautiful Thanksgiving table along with the all of the gratitudes. I hope you had a wonderful Thanksgiving. Your table is absolutely gorgeous! Thank you for sharing with us! Your table takes my breath away, just beautiful, Susan. Beautiful table. I'm sure your family was thankful for the opportunity to dine at such a lovely table! 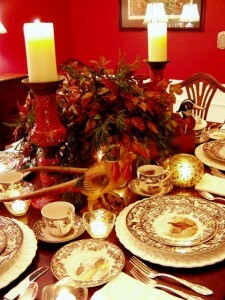 I used my red Spode too but never took a picture. . .too much going on. Happy Thanksgiving Susan! Hope you had a wonderful holiday! Happy Post Thanksgiving! What a gorgeous table. Love all the RED! I love those red candle-sticks and all of the berries for the decorations. And those little tureens are adorable! Wonderful job, so pretty to look at. Have a great weekend! Thanks again for sharing your beautiful tablescapes. Mine are less elaborate but I hope there might be an idea or two to inspire someone else the way you've inspired me. I was so touched that tears started streaming down my face as I read the things that they are grateful for. Excellent post, and as always, such a beautiful tablecape! I'm a little late in posting (trying to catch up after Thanksgiving). Gorgeous tablescape!. Thank you for sharing the Mikasa posts. I read them on Facebook and was touched by so many. Happy Holidays!